Bumper Jacksons are hot and sweet, painting America's story from the streets of New Orleans to Appalachian hollers. Unafraid to scrap together new sounds from forgotten 78's, the Bumper Jacksons elegantly balance paying homage to the traditions while fashioning their own unique, playful style. The group began as a duo, a city-meets-country experiment between songstress Jess Eliot Myhre and banjo player Chris Ousley. They hopped on bicycles, touring the country, instruments on their backs, seeking to reimagine roots music. In five short years, Bumper Jacksons grew to a brassy seven-piece, with horns and pedal steel. They've been honored multiple times as the Mid-Atlantic's "Artist of the Year" & "Best Traditional Band" at the Washington Area Music Awards. 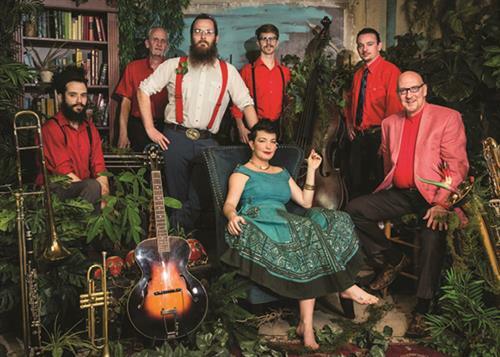 Bursting at the seams with some of the richest threads of old America, Bumper Jacksons bring you into the center of a party where everyone's invited in Sunset Center's own Studio 105!